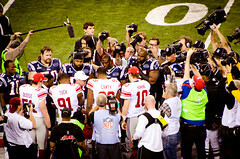 Win a Super Bowl Advertisement for Your Small Business...For Real! We watch them every year and marvel at the creative, and sometimes crazy, commercials aired during the Super Bowl. That kind of mass exposure is typically reserved for large companies who can afford $4 million for a 30 second spot during the big game. But, Intuit is offering your small business a chance to air your very own Super Bowl commercial. Then, start promoting! You entry will appear on the Intuit Small Business Big Game website where anyone– your customers, your admirers, your family, that guy you met on the street—can vote for your business and share your link. Encourage voting early and often—one vote per person per day is allowed. The top 50,000 entrants will be invited to participate in Round 2 of the contest. For round two, you will be asked to submit a video and provide answers to four questions about your business. Then the public voting starts again to determine your public appeal score, and you’ll need to martial your supporters once more. (So remember to get an email address from that guy you met on the street.) The rest of the round two score is determined by Intuit employees using the following criteria: a compelling story and demonstrated passion for the business (20%); a submission that authentically represents the small business and its owner (20%); an entertaining submission that creates an emotional connection with viewers/readers (20%); the ability to appropriately represent Intuit as a brand ambassador (20%); financial stability of the business (10%); and the Public Appeal score (10%). Be sure to keep those criteria in mind when you write your initial 600 word entry. 20 Semi-finalists will be chosen, and then Intuit employees will narrow it down to four finalists. The public will get to vote on the final four, and that public vote determines the winner and second, third, and fourth place finishers. First prize is that coveted 30 second Super Bowl spot, produced by Intuit and featuring your small business. Second, Third, and Fourth place finishers will win an Intuit TV spot featuring their business and aired on FoxSports1 in 2014. All top 4 finishers will win a Super Bowl Viewing Party trip to New York City. Additionally, everyone who submits will be entered in random sweepstakes drawings for a number of prizes including a trip to the Super Bowl, $1000 small business grants, free QuickBooks software, Google Adwords or Facebook credits, and signed pro-football memorabilia. Even if you don’t win anything, you still get to promote your business on the Intuit Small Business Big Game website. If you do win, it could be a whole new game for your small business. The deadline for submissions and initial public voting is September 22, 2013—so enter today!